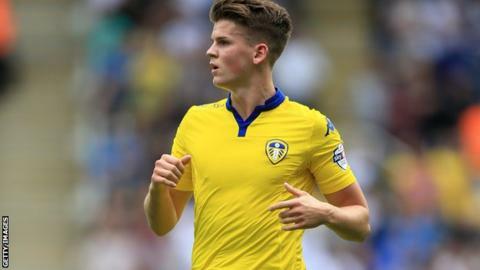 Leeds United chairman Massimo Cellino said he didn't want to get "emotionally involved" in discussions over Sam Byram's future. Byram, 22, is in his last year of his contract with Leeds and has made nine appearances this season. Cellino praised Byram's development at Leeds, saying he was "still a baby" in football terms. "I think a good player should be kept rather than sold or we're wasting our work," Cellino told BBC Radio Leeds. "Sometimes when a player says they want more, I can say listen, if you want more, you have to make me win. "Sam Byram is a player that's come from Leeds and grown in Leeds. I was expecting he would show that he is more affectionate to Leeds and he wants to stay here." Byram made his senior debut for Leeds in August 2012 after rising up through the youth ranks. He has scored six goals in 114 appearances for the club and Cellino seemed keen to keep contract negotiations open. "I let [former chief executive] Adam Pearson deal with his agent because I didn't want to get emotionally involved," he added. "I said to deal with the agent because I would be dangerous doing that. Adam tried to but he didn't get anywhere. "If Byram doesn't sign a contract with us, it's not a matter of money. I don't want to start this club doing something that can hurt them again by paying wages that cannot belong to our reality."